Yesterday my lovely friend Natalie (http://plutoniumsox.blogspot.co.uk/) sent us a self adhesive Blackboard film roll from The Works (a discount book store that sells lots of other lovely things such as art and craft supplies). I straight away stole her suggested idea of covering a small table with it as she has done for her daughter. The boys have been really pleased with this new addition. We got the table and two chairs for the bargain price of £17 for the complete set from IKEA last year if you're looking for something similar, but a reclaimed side table can also be customised really effectively for this project. 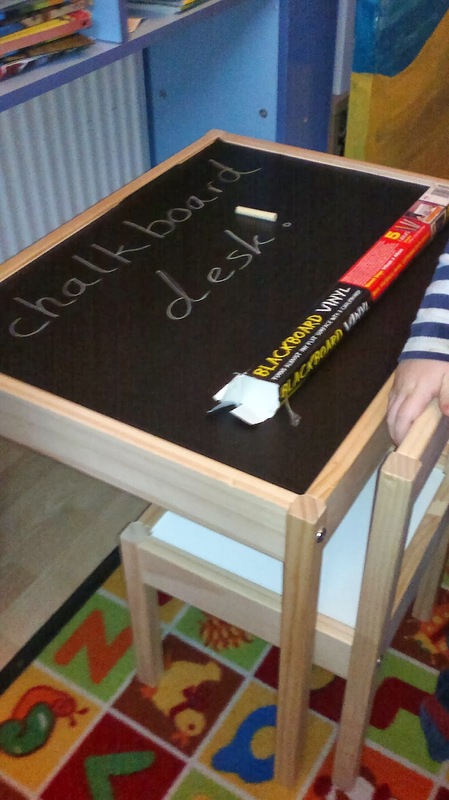 I love the idea of giving the boys the opportunity to be creative whenever they want to be, not just when I get out the make and do box, but occasional pen on the walls and furniture means that I regard chalk as my friend for this. I already leave chalks in Ollie's room and encourage the boys to use the dark blue panel on Ollie's bed as a chalkboard, but this new vinyl is so much more effective it's already become a favourite. Toby was the first to notice the new drawing surface and has been covering it with snakes. 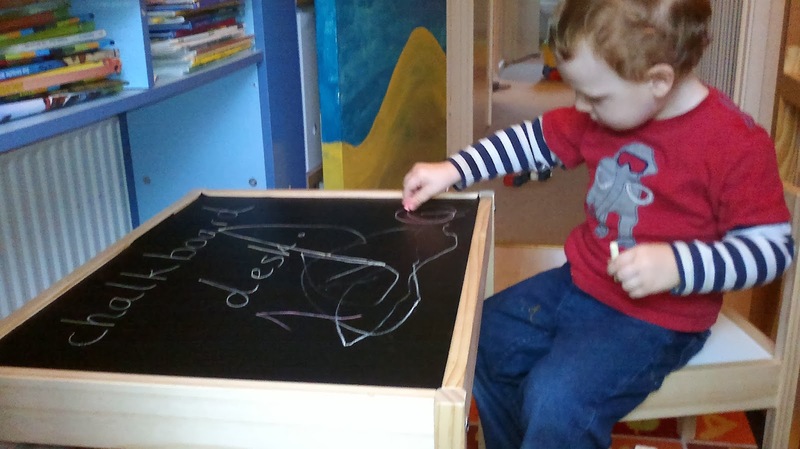 He has a real love of snakes and always says 'snake, look, snake' while he's drawing, which anyone following our progress with his speech delay will understand how much this means to us. 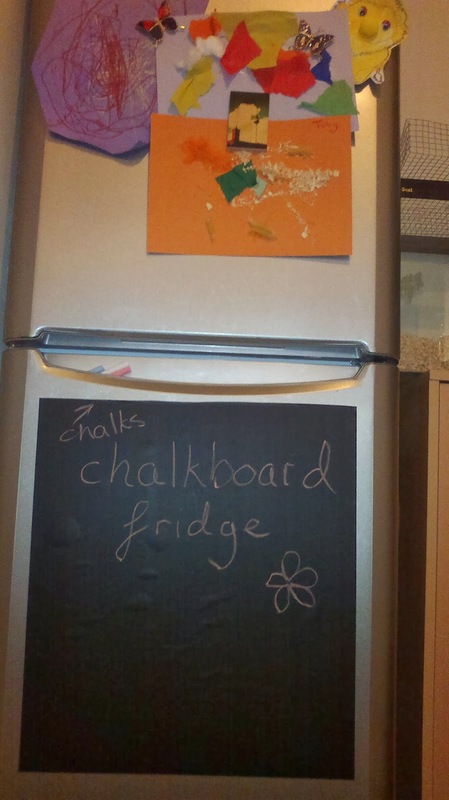 blackboard - the lower door of the fridge-freezer. I thought this looked perfect because then there would be a permanent drawing surface downstairs, and the scoop shaped door handle is ideal for storing the chalks. I suspect there will be a lot of additional drawing on the white painted wall next to the fridge as a result of this, but if it gets too much I will just restrict Toby to white chalk for this area. 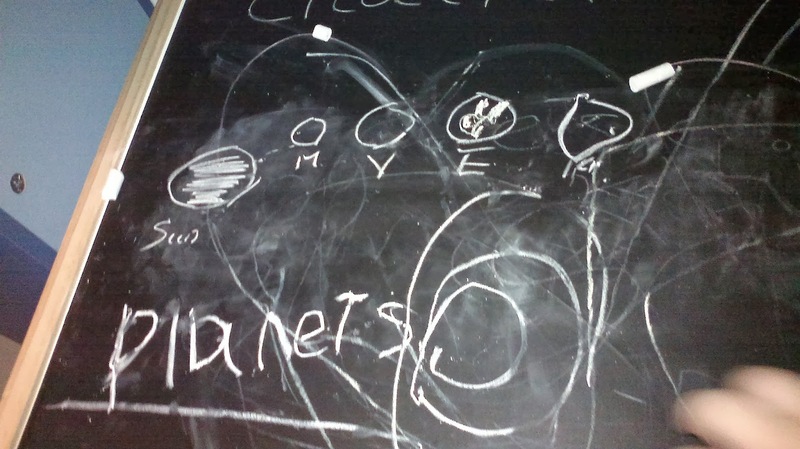 When I went back upstairs having put the vinyl on the fridge I found three very happy lads using the blackboard table. Toby had a book propped on it looking at pictures of trains, Matt had drawn the planets and Ollie had copied the word 'planets' out of a book. This is a real leap for Ollie since up until a couple of days ago, apart from his own name, he only wrote words if you told him the letters to put one at a time. Suddenly he has started copying any words he sees - the first one was at the zoo on Friday when he copied the name 'Toby' on a Toby the Steam Tram colouring sheet. Communication is such an important tool for us social animals and one of the ways we can support acquisition of communication is by providing opportunities, whether it is by wearing your little one in a sling so you talk to them more often than when they're in a pram, or by giving them lots of chances to practice holding a drawing implement like a piece of chalk. Plus, when they've gone to bed it's a good place to play hangman. I wonder if 'lynx' really is the hardest word to guess. Note, the vinyl peels off easily and I haven't noticed that it left any marks or residue when I did peel it back to test it, but it's early days so it's probably best not to stick it to anything you're worried about getting sticky or discoloured.